Subject: how would you name these Killers? who are among some 15,000 imported by Mojtaba Khamenei (Supreme Ruler's son) to LETHALLY suppress demonstrators and senior clerics who oppose him and his father and their alliance/coup with Ahmadi-Nejad the Turd. Aircraft bringing in the mercenary Hezbollaha and other Palestinians were landing at the Southern port of Mahshahr. 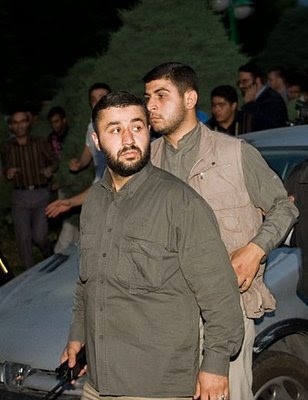 The bearded man pictured above in a green shirt holding a walkie-talkie, patrolling the streets of Tehran is Hezbollah of Lebanon's Hussein Monif Ashmar a leading operational member of the terror group with responsibilities including organizing suicide attacks. 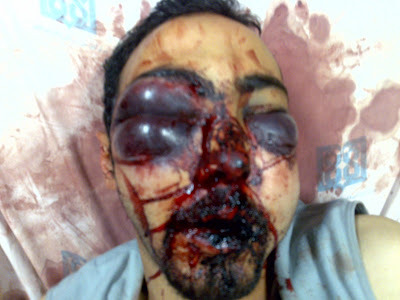 His photo was identified by a now exiled former member of Quds (islamic iran's Special Forces) : Amir Farshad Ebrahimi. Protesters have captured, identified and released Arabic speaking suppression members from the following countries: Somalia, Sudan, Oman, Syria, Yemen and Palestinians. Venezuelan security outfits were sent recently by Hugo Chavez to protect Ahmadinejad and Khamenei since they no longer trust Iranian security personnel. Remember when Ahmadi-Nejad spent nearly $650,000 (EACH ) on three bomb sniffing dogs (Alsatians) to guard his office? To the horror of his staff and visitors who consider dogs as utterly unclean and not to be touched or be sniffed by them. Usually in foreign policy circles the use or entering of foreign troops into any land signals a greater strife, and usually heralds war. This information is in the least, disturbing. Iran's sovereignty has been compromised, and will cause a dangerous imbalance in the geopolitics of the middle east. The use of Palestinians goes back to before the 1979 revolution when Yasser Arafat had flown militias to help in the street killings of the Islamic revolution. AND CARRY OUT EXECUTIONS in the prisons. Arafart received billions of dollars from Khomeini after the victory of the Islamic revolution. And the contents of the homes of the rich and famous which Khomeini, who had spent his life sitting on a cushion on the floor granted him persmission to plunder. Convoys of some 200 trucks a day, loaded with sometimes priceless art and museum pieces were trekking out if Iran and back. When this dried up Arafart told Khomeini he had to return to run things at home and his men forced young Iranian vigilantes to start doing the executions themselves or be shot down by the Palestinians. Once they had executed a few dozen, combined with having watched it happen, soon inured them. Encountering Hamas in Teheran is tantamount to meeting an African American at a KKK gathering. Remember this man. 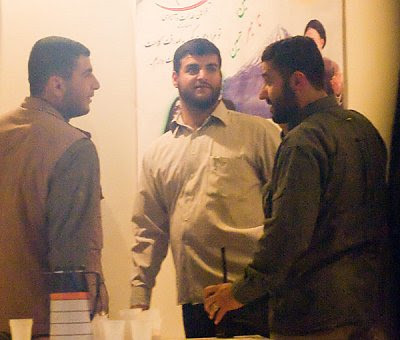 Hossein Taeb is the commander of Bassij and one of the criminals against humanity. His grandchildren would be very proud of him! It that a taser in his hand? Posted: Sat Jul 11, 2009 4:21 pm Post subject: Genghis Kahn is back - in Iran. Genghis Kahn is back - in Iran. Posted: Sun Jul 12, 2009 8:04 pm Post subject: where is our money? Instead of " Where is my Vote?" Iranians should say"Where is my money???" Foreign bank accounts of prominent Iranian Leaders. نام و چهره این پاسدار جنایتکار را به خاطر بسپارید || سایت موج آزادی: تکان‌دهنده‌ترین گزارش‌ها در این میان به بازداشتگاه غیرقانونی کهریزک اختصاص دارد که بر اساس گزارش‌های موثق و متعدد، تحت نظارت مستقیم سردار رادان قائم‌مقام فرمانده نیروی انتظامی کل کشور اداره می‌شود و فضایی یکسره قرون وسطایی بر آن حاکم است.شاهدان عینی و بازداشتی‌های آزاد شده از کهریزک، وضعیت این بازداشتگاه غیر قانونی را این‌گونه توصیف می‌کنند:در یک سوله‌ی 200 متری بدون وجود دستگاههای تهویه‌ی هوا، چندین معتاد کراکی که امیدی به زنده ماندن آنها نیست و بدن‌هایشان کرم گرفته، دراز به دراز بر روی زمین افتاده‌اند؛ و در کنار آنها، بازداشت شدگان نگهداری می‌شوند. بازداشت‌شده‌ها حدود 100 نفرند که به این محیط غیر بهداشتی با هوای نامطبوع منتقل شده‌اند. آنها صف می کشند تا بتوانند از زیر در، ولو برای دقیقه‌ای از هوای بیرون تنفس کنند.هر روز صبح سردار رادان به این محل سرکشی می‌کند و خود شخصا هر روز چند نفر از بازداشت شدگان را مورد ضرب و شتم و شکنجه قرار می‌دهد. بهترین ابزار شکنجه در دست رادان، شلنگ است. وقتی صبح هر روز صدای هلیکوپتر می‌آید، بچه‌ها به خود می‌لرزند و می‌فهمند که رادان آمده.یکی از بازداشتی‌ها در اثر برخورد باتوم به سرش، کم کم بینایی خود را از دست داد؛ ولی با وجود اطلاع شکنجه‌گران کهریزک از وضعیت وی، او را از این محل غیر بهداشتی خارج نکردند. دو روز قبل از آزادی، بازداشت‌شده‌ها به اوین منتقل می‌شوند و فردی که بینایی خود را از دست داده بود، در اتوبوسی که به سمت اوین در حرکت بود، بر روی پای یکی دیگر از بازداشت شدگان جان می‌سپارد. The name and face guard criminals remember | | wave of freedom site: Tkandhndhtryn reports this to the illegal detention Kahrizak allocated based on the numerous and credible reports, under the direct supervision of police chief Sardar Radan Ghaem Maghami whole country is run and Space the medieval way of ruling is. Bazdashtyhay witnesses and released Kahrizak the status of this illegal detention of these are described: a 200-meter سولهی without air conditioning machines, several crack addicts who are desperate for their survival and Bdnhayshan the worm, a long long Aftadhand on the ground, and beside them, the detainees are held. Bazdashtshdhha about 100 Nfrnd insanitary environment that unpleasant air are transferred. They queue in order to tide the following, albeit for a minute to breathe the air outside. Sardar Radan every morning to this place and personally inspect each day with a few people about the detainees to beatings and torture is. Radan best tool available on torture, is the hose. When the sound of helicopter comes every day morning, the children and their Mylrznd Myfhmnd that the Radan. Bazdashtyha of the encounter Batvm to her, little by little has lost his sight, but despite the status of the information Shknjhgran Kahrizak, him The location of non-health did not. Two days before freedom, and are transferred to Evin Bazdashtshdhha person who lost his vision was a bus that was moving in the Evin prison, another on foot Myspard John detainees. My hope is every single one of these murderers, would be in front of a judge soon, and get convicted. Their assets taken away and be given to the people, especially those who were killed or tortured. Their days is getting closer.... lets start from Khamanie and go down the list. Let's not forget the two faced opportunists, like Shirin Ebadi, the lobbyists like Trita Parsi...and all others that are or were part of the regime and now have decided to change color, because it is more convenient & gives better opportunity to take the other side! Identifying the members of the secret police in an attempt to shame the individuals. Please do not use this video to incite violence against the individuals who commit the crimes of subduing many universal human rights.